Adolescents cope better if they think that their deployed parents are doing something good for the country. Washington (CNN) -- Adolescent children of frequently deployed soldiers are less stressed than conventional wisdom might indicate, according to a recent study. Researchers at the Army War College's Strategic Studies Institute found that although these teens generally experience higher stress levels than their nonmilitary counterparts, they have better coping skills than the authors expected. "The adolescents are a lot more sophisticated than we think they are," said Leonard Wong, Army War College research professor and one of the study's authors. The study's results were released Thursday. Wong and co-author Stephen Gerras, both retired Army officers, said two factors in particular contribute to reducing the stress level of a child whose parent is deployed: a strong family and high participation in activities, especially sports. The researchers, who say they are given academic freedom by the War College, found that Army adolescents cope better if they believe that America supports the war, and if they think that their deployed parents are doing something good for the country. The 2009 study surveyed 559 Army adolescents, 56 percent of whom said they coped "well" or "very well" with deployments. Seventeen percent said they were coping "poorly" or "very poorly," according to the report. The survey findings indicated that the teens coped better with each deployment, according to Wong and Gerras, who later personally interviewed more than 100 military teens to gain more context. "They've learned that Dad's coming back. It's not something that they want, but they understand," said Gerras, who is a professor of behavioral sciences at the Army War College. Katie Glenn, a college senior, told CNN she and her two younger sisters have each endured their father's multiple deployments differently. 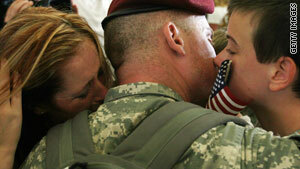 "My dad did not deploy until I was 14," she said, so she was able to spend a lot of time with him during her pre-teens. Her middle sister is in high school, and "remembers Dad coaching soccer and going to her dance recitals," Glenn said. "But he missed her homecoming [and] probably won't be there for her prom, she said. Glenn's youngest sister is a "post-9/11 military child," she said, and will probably live the "military lifestyle" of "moving every two years her entire life." But, she adds, "We're all proud of what he does, and we know what's being asked of us." The Army War College results appear to clash with last December's RAND Corp. study published in the American Journal of Pediatrics that suggested children of deployed service members face emotional and behavioral challenges. But the Army War College authors insist the two studies are more similar than different, in that both reveal that military teens are more stressed than their "civilian" counterparts. RAND "found that the length of parental deployment and the mental health of the nondeployed caregiver were significantly associated with the number of challenges experienced by children (as observed by the caregiver) during deployments," Wong and Gerras write in their report. "We looked more specifically at factors that influenced the stress," said Wong, reiterating that their information came largely from the adolescents themselves, not their parents. The authors of the RAND study did not immediately reply to a CNN request for comment. Other behavioral experts said they were not surprised by either study's findings. "We've seen this before. If the parent does well, the kid does well, but if the parent doesn't, the child doesn't," said Dennis Embry, president and CEO of Paxis Institute in Tucson, Arizona. Embry's concern is the time-testing effect. "What worries me is, with the economic crisis, the caregiving parents in lower-income military families are going to be more vulnerable now. Charitable contributions are down. That's beginning to pervade the psyche of the caregiving spouses, and they become more stressed. The kids become more stressed," he said. Michelle Kelley, a psychology professor at Old Dominion University in Norfolk, Virginia, said the concept that multiple deployments actually help military children is a "tough and age-old question." "The RAND report seems to indicate 'no.' The Wong and Gerras study seems to indicate that up to three deployments is associated with lower stress, so maybe these youth do learn to cope," she said in an e-mail to CNN. During Wednesday night's State of the Union speech, President Obama said that he was giving his "full support" to service members. "And that is why Michelle [Obama] has joined with Jill Biden to forge a national commitment to support military families," he said.